The real question aspiring writers should ask is not whether they liked a book, but whether they think the author accomplished what they set out to accomplish. ... If the author set out to write a cracking thriller did they write a cracking thriller? If they wanted to create beautiful prose and make us think deeper about ourselves, how well did they do that? Once you start looking at an author's intent, you'll start to see where they succeeded and didn't succeed at what they were trying to accomplish. And you'll also start seeing that what most megabestsellers have in common is that the authors were phenomenal at delivering the thing(s) they set out to accomplish and at giving readers the experiences they wanted to give them. 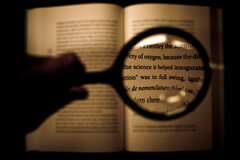 You'll start absorbing the positive attributes of books you might not even like all that much. Read the whole thing. Here Bransford applies one of my favorite aphorisms, namely that intent is ultimately the thing. We can approach books in any number of ways, but until we understand what the author wanted to accomplish we’re missing the main point from the get-go. It’s a valid point up to a point. What the author intended is only a part of the equation. Did he achieve what he intended? He may believe he has but a reader brings his own variables along with him. My third novel is riddled with references to Samuel Beckett but if my reader has never read Beckett then the book will have to stand on fall on just the story. I just wish that Twilight had featured actual vampires rather than sparkly, lovelorn critters dubbed with the same name. Agreed. An author can't dash off something poorly written and say, "Well, the reader just has to understand my intent." They aren't mind readers; we have to do a good job communicating our intent, too. I probably feel more strongly about it with respect to critiquers - a critique that says "I see what you were trying to do here but..." is always more helpful than "It's not my sort of story...". This sheds another light on what Nathan's saying - not that consumers shouldn't ask the question, but that writers shouldn't. A critiquer is reading partly to help a writer, a writer is reading to better understand writing, and a consumer is reading to entertain themselves. I think you nailed it there: Readers and writers are approaching a work with different things in mind. There's nothing wrong with looking for enjoyment in a work, but we who writer should be looking for something more. Bransford would probably agree that there are a number of successful titles that are, er, less than excellent. He'd probably say the best thing to do is take what you can from them as a writer and leave the rest behind. Or do something involving them and a behind, anyway. I agree with Ben--the most salient point is that writers realize that there are many goals of writing, some of which they may not share. Darn it, CR, I've got like next-to-no time left on this public library computer I'm using, and here I find this substantial comment. In short, I think you have a good point. Authoral intent isn't the only thing to look for. We also should be able to evaluate a work, and we can do that in any number of ways. I just think we need to start with understanding before we move on to evaluation. For example, I think the reader response folks have it wrong from the get-go when they insist that readers construct meaning in much the same way stargazers construct constellations. I'd argue that we discover it like someone digging for jewels. Twenty-two seconds left and I'm off!